It has been 10 years since Iceland enjoyed the country’s finest hour in handball. One of the greatest triumphs in Icelandic sports, the men’s national team won the silver medal at the 2008 Olympic Games in Beijing. National coach then, and now, was Gudmundur Gudmundsson, though the 57-year-old coach has not been in the job throughout. He joined for his third stint earlier this year after Iceland crashed out of the EHF EURO 2018 in Croatia after the preliminary round. 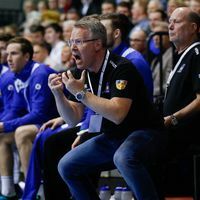 Gudmundsson believes in the chance to build an Icelandic national team which can reach the same level as the team which earned Olympic silver in 2008 and EHF EURO bronze two years later. But at the same time, he realises that it will take time. The project means that the coach is mainly working with young, talented players. His squad includes a playmaker who is 17 (Haukar Thrastarson), a left wing of 18 (Dagur Gautason) and several other under-21 players. “It is obvious that such a young team needs time to mature, and that is why we have given this project three years. Personally, I find it very exciting to be part of this,” the experienced coach says. "Interesting group with very different teams"
In qualification for the EHF EURO 2020 in Austria, Norway and Sweden, Iceland have been drawn into Group 3, where the opponents are FYR Macedonia, Greece and Turkey. Iceland are hosting Greece on Wednesday at 19:45 hrs local time (live on ehfTV.com) before visiting Turkey on Sunday at 16:00 hrs local time (live on ehfTV.com). Qualifying for EHF EURO 2020 is "crucial"
So qualifying for the World Championship 2019 in Denmark and Germany has been an important step in the development of the team, but reaching the EHF EURO 2020 will be “just as crucial,” the coach emphasises. Gudmundsson welcomes the fact that the EHF EURO has been extended to 24 teams from 2020. It means playing more matches, and that is just what he needs for his young team. "The potential is definitely there"
Gudmundsson praises “the amount of talent and eagerness” in his young team, making him confident that those players can ultimately match the level of the team that excelled on the Olympic stage a decade ago. “The potential is definitely there, so I see a bright future for Icelandic handball,” says Gudmundsson, who has a proven track record of making national teams successful. Apart from winning Olympic silver in 2008 and EHF EURO bronze in 2010 with Iceland, he led Denmark to gold at the Olympics in Rio de Janeiro in 2016, and Bahrain to silver at the Asian Championship in January, just before taking over at Iceland for a third time.